This is a remarkably large and lavishly illuminated Book of Hours, combining French and English styles. The first leaf contains a list of obits members of the royal family and of the 4th, 5th, and 6th Earls of Ormond and their wives, so it was probably made for Anne Boleyn's grandfather, Thomas Butler (1426-1515), 7th Earl of Ormond, or a member of his family. It was given in the early 16th century to a chapel at 'Suthwyke', probably Southwick in Hampshire. 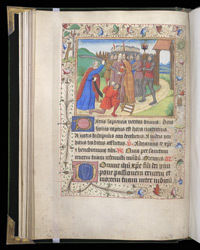 In some Books of Hours the Hours of the Virgin have the Hours of the Cross mixed in, as in this example. Here, the Hours of the Cross are introduced by a half-page miniature showing several events simultaneously: Judas kissing Christ to indicate to the soldiers who he is; the soldiers arresting him; St. Peter cutting off Malchus's ear, and Christ healing it.